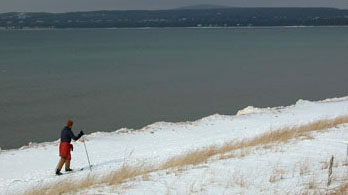 Petoskey State Park has a limited ski trail system that often serves as a place where locals go for a quick outing. Everybody else who has driven this far north usually searches for something more extensive. The 1.5-mile loop is posted with blue markers and is occasionally groomed when there is snow and staff available. The ski trail is ideal for novice and beginners as it winds through the closed campgrounds, into the woods and then back along the unplowed park road. Even after recent snowfalls the trail is popular enough that there is often a good set of skier-set tracks for classic skiing. When the trail enters Tanner Creek Campground at the south end of the park there will be tracks everywhere where skiers seek to add additional mileage. By heading east into the dunes you can connect with the Portage Trail for more challenging elevation. 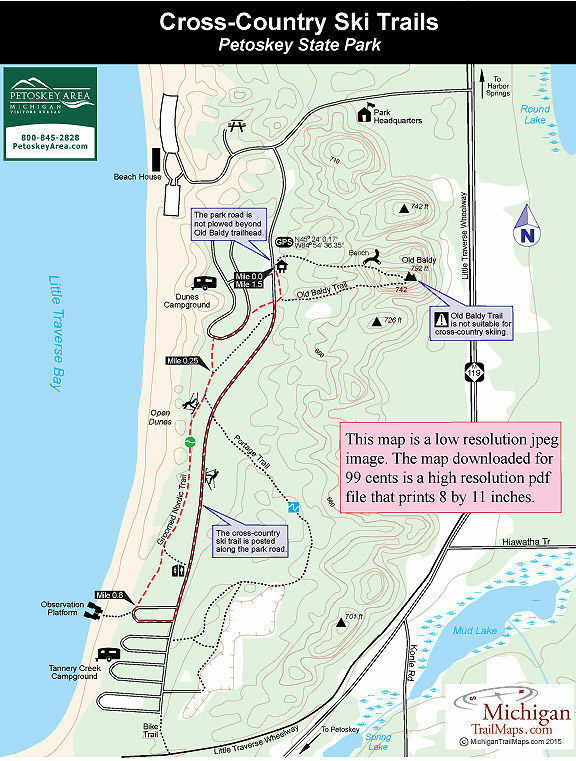 To the west trails will lead to a series of observation decks and snow-covered boardwalks to little Traverse Bay. Although you have to watch for occasional patches of sand, the frozen shoreline with it ice formations can an interesting place to ski. The park road is plowed only to the Old Baldy Trailhead, across from the camper’s contact station. Most of Old Baldy is not suitable for Nordic skiing but the end of it serves as a two-way stretch of the cross-country loop and in the parking area is clearly marked for skiing. It leads into the woods and then quickly emerges at the park road and crosses it to enter Dunes Campground. 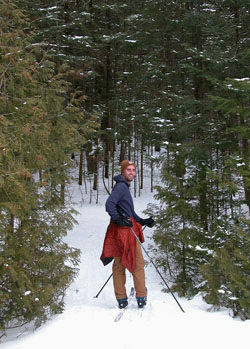 You ski through the campground, past idle picnic tables and fire rings, and then continue on the Campground Trail. At a junction, reached at Mile 0.25, a yellow arrow points to the left for the park road and Portage Trail on the east side. Stay to the right to continue on the posted ski loop and at Mile 0.7 you pass another junction and then enter Tanner Creek Campground. Take time to leave the posted trail and check out the shoreline, even if it’s just to ski 100 yards to a nearby observation platform. If it’s windy, the surf rolling in will be exploding at ice volcanoes along the beach. The ski loop swings sharply east (left) at Mile 0.8 and quickly arrives at the unplowed park road. Follow it back to the trailhead or jump off at Portage Trail to take on some elevation among the dunes. The park campgrounds, day-use area and most other facilities are closed during the winter.